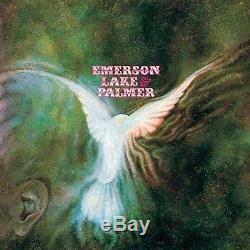 Artist: Emerson, Lake & Palmer Title: Emerson, Lake & Palmer [DVD Audio+2HQCD] [DVD Audio] DVD (Japan Import) Format: HQCD Product Code: VIZP-111 ISBN: 4988002632787 Label (Brand): Victor Entertainment Release Date: Nov 21, 2012 Number of Discs: 1 Japanese Import. Audiophile Quality Explained - Hearing it makes a difference! Item shown is available at time of listing through our distributor in Japan. We specialize in obtaining rare imports! Worldwide Additional Item(s) cost. Covered if delays in transit occur. ITEM MUST BE RETUNED WITHIN: 14 DAYS. Bottom line, we want you happy! We carry a wide variety of classical music imports, direct from Japan. We stock optimal music formats such as SHM-CD, BLU-SPEC, SA-CD, HQCD, XRCD, and MORE! We have access to over 100,000 new release CDs and older titles. We can obtain rare, out-of-print CDs or DVDs. We want to be your #1 source for Japanese imports. The item "Emerson, Lake & Palmer Emerson, Lake & Palmer DVD Audio+2HQCD DVD Audio" is in sale since Wednesday, April 06, 2016. This item is in the category "Music\CDs". The seller is "jpop4me" and is located in BC, Canada. This item can be shipped worldwide.